Hi everyone, Dion Dior here. Welcome to Friday. 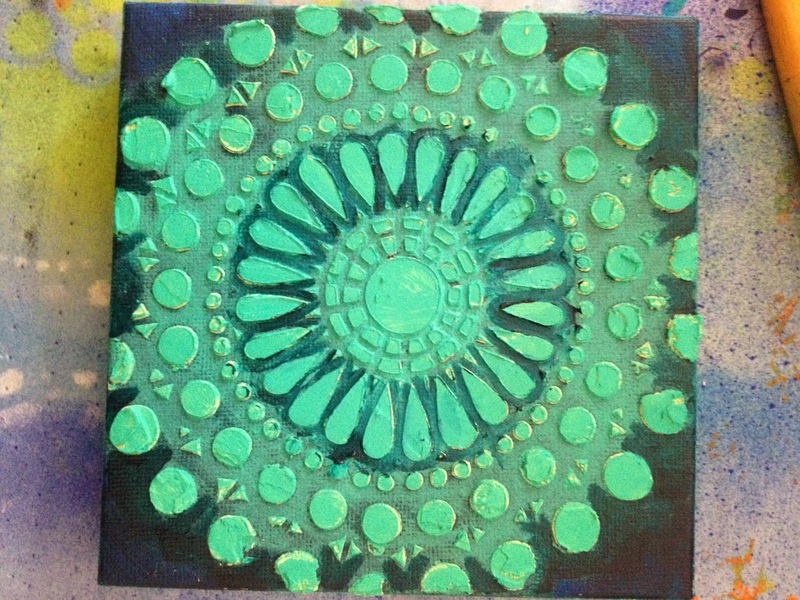 This week I had the children home on spring break and finding the time to make art was a challenge. My usual Friday sketching expedition out and about in my town didn't go as planned. It's difficult to sit in a cafe or on a street corner and sketch with an Autistic 4yo in tow. My 8yo however is a joy to take sketching, she loves to join me with her own little sketchbook and tools. Nonetheless, we did manage to sketch and we continued our exploration into warm/cool colors. This week we decided to sit at the kitchen table and sketch whatever we could see in front of us. Of course, that meant whatever was on the table. In the center of our table was a big bowl and fruit, napkins and a salt & pepper grinder. But getting a solid perspective of this scene was like running a gauntlet. My 4yo likes to take the fruit out of the bowl and line them up along the edge of the table as he proudly announces the name of each fruit and it's color. He especially loves the 'Orange Orange'. He thought it was hysterical and let the concept morph into a double announcement of everything he could see...'apple apple', 'chair chair', 'mommy mommy'...and so forth. Needless to say we were all joining in. So my Friday Sketch this week was done in my Stillman &Birn "Beta" Series Sketchbook with watercolor and ink. It is a good exercise in using colors from the warm side of my palette. Even the dark and neutral colors were done in warm tones. What's on your kitchen table? Is it warm or cool? Don't forget to post your Warm/Cool sketches in the Flickr Group, and tag them with the code mar958 so they can be included in the end of month slide show. If you'd like to join in on Friday Sketches, click here. 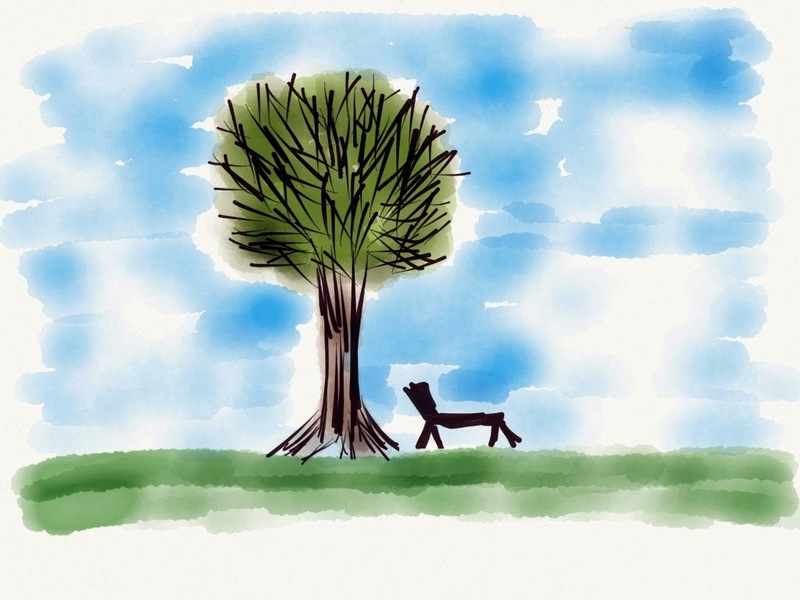 A lush green landscape with trees full of leaves with my lounge chair underneath enjoying warm days with blue skies. The Collaboration continues with Jamie Fingal and Leslie Tucker Jenison. 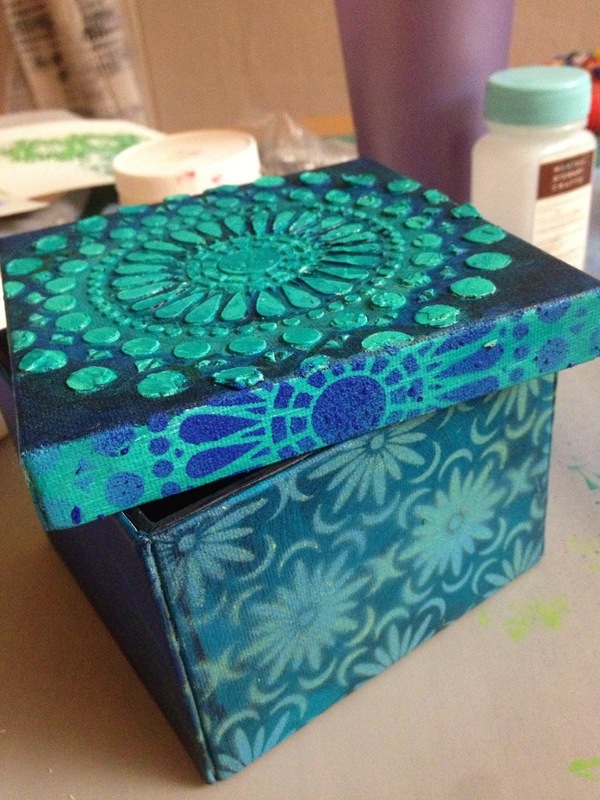 This is the box that we are using this month from Blick Studio. It is covered in primed canvas. I mean how cool is that? Jamie Fingal. 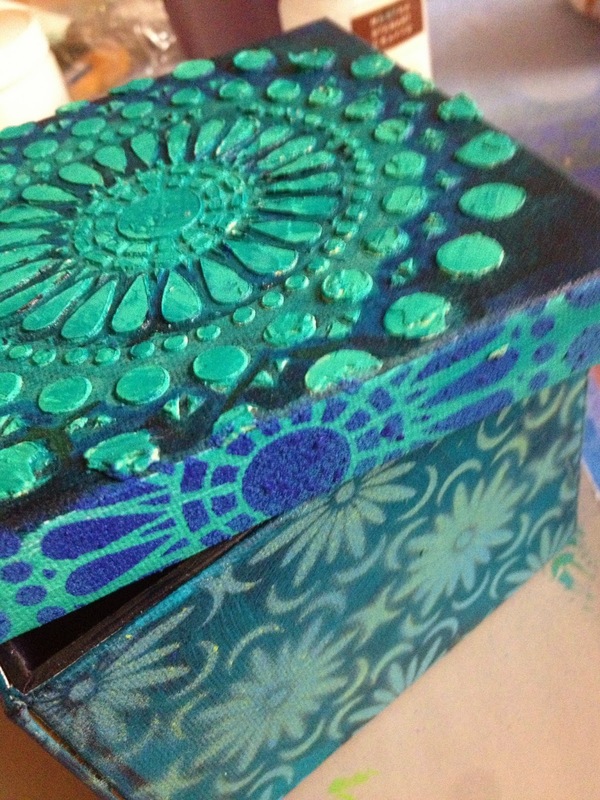 I am taking this cool box and painting it with warm colors - red and purple. 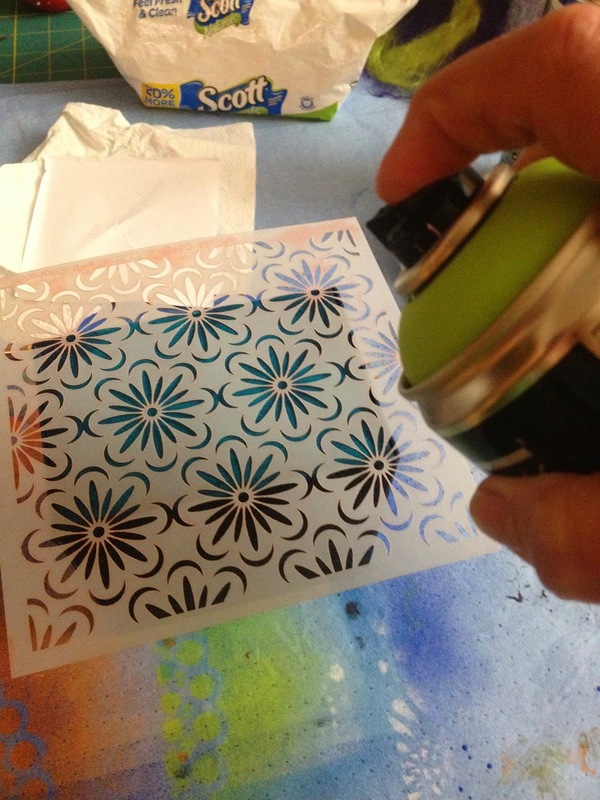 I am using a variety of stencils all from StencilGirl Products. 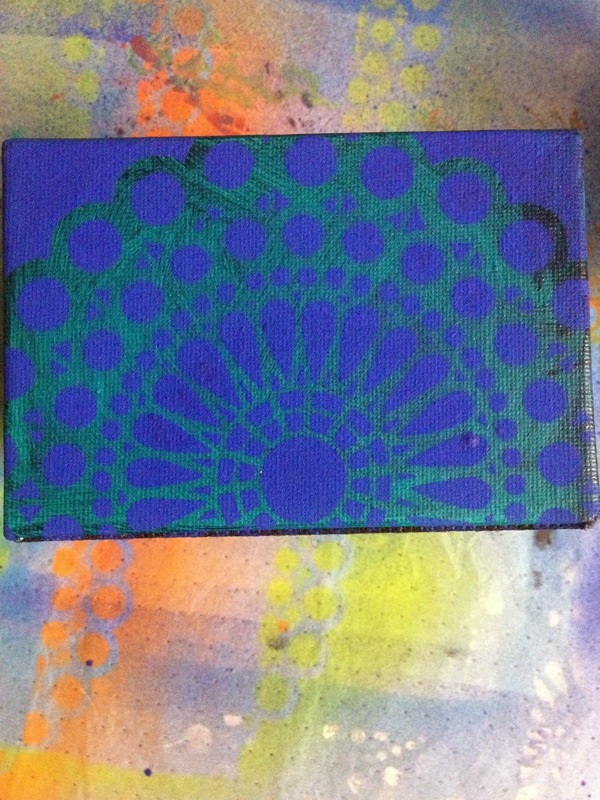 Using my stencil "Industrial Fence," I am painting with acrylic paint - red on a purple side of the box. I love how this design flows. Just fun, especially with the dots! 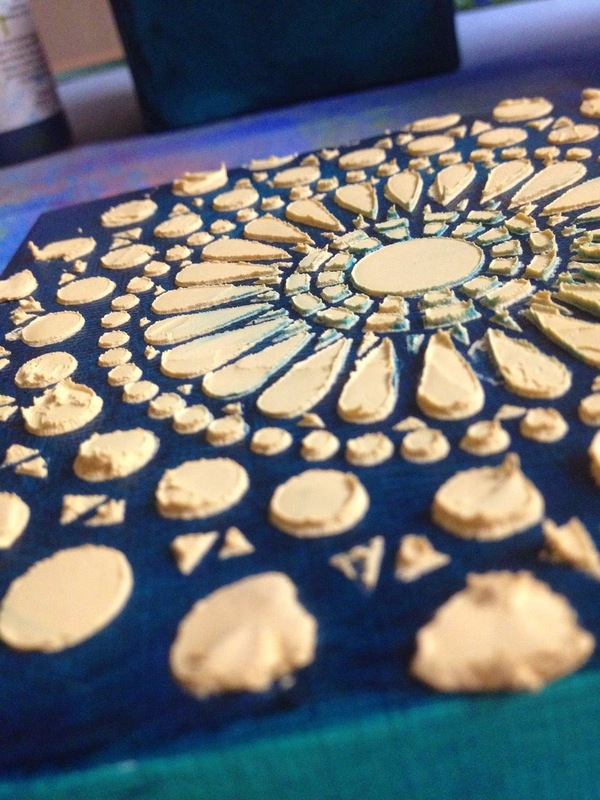 Now the "Zen Landscape" stencil - with purple paint, that has a bit of cool white in it, to give it more bounce! This is how it looks on the box! I am still learning the importance of walking away and letting something dry, before proceeding. Therefore avoiding smeared paint and other issues. "Houses" stencil - my design! Isn't this fun? 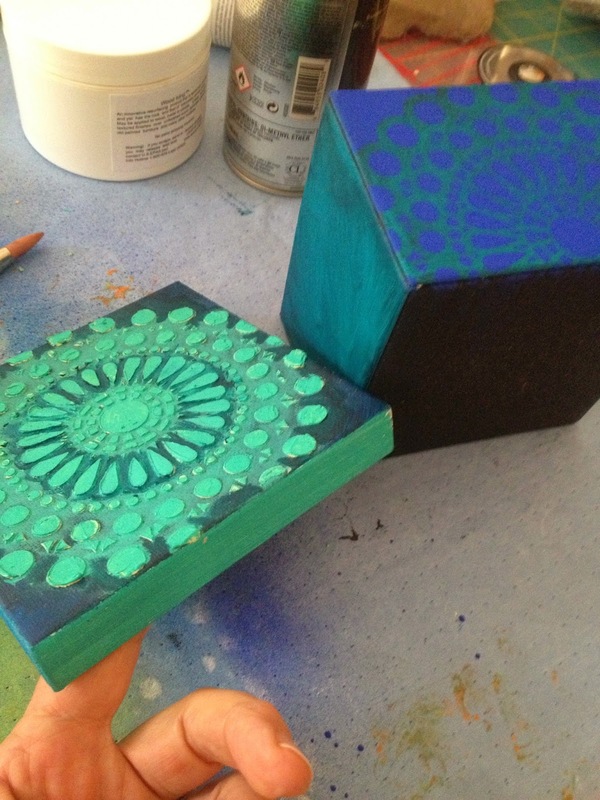 And now I'm using one of the house blocks for the lid of my box. Purple on red. Nice contrast. Love this house block, as it reminds me of one of my quilts. I like the box, but I think it needs some legs on the bottom. I marked the bottom of the box with Avery rings, the kind you use to prevent tears in punched holes in paper. I like these because they come in bright colors. Power tools! Get out the Makita! I drilled each hole right in the center of those, then removed the pink circles. I dug into my bead box to find these one inch beauties. Using creative wire and some heavy duty pliers, I made a loop at the bottom, then put the wire through the bottom of the box. I used pliers to swirl the excess wire into place inside the box, to keep it in place. Leslie here. Hi there! Jamie and I are really having fun with this ongoing collaboration (from a distance). 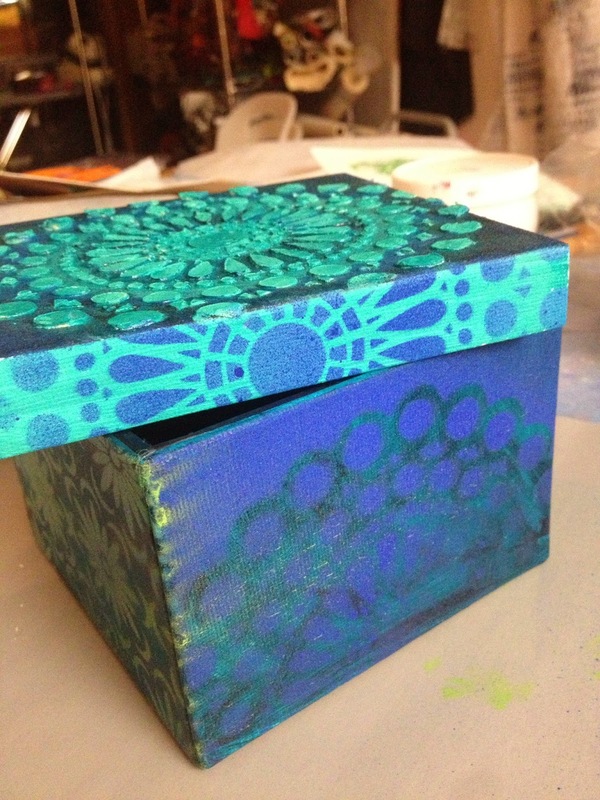 Jamie's box tends toward warm colors, and I'm heading over to the cool tones for my project. I am using the same type of box. 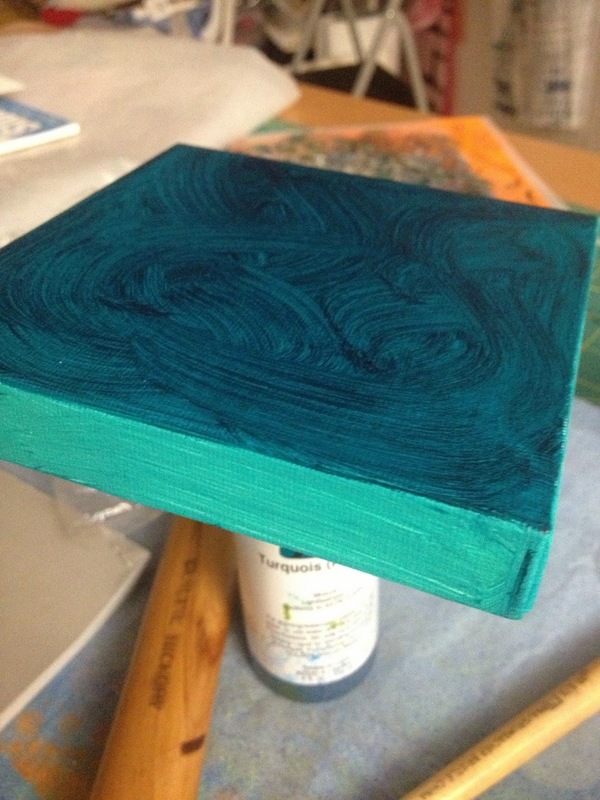 Wood Icing, Liquitex spray paint, and two shades of acrylic paint. 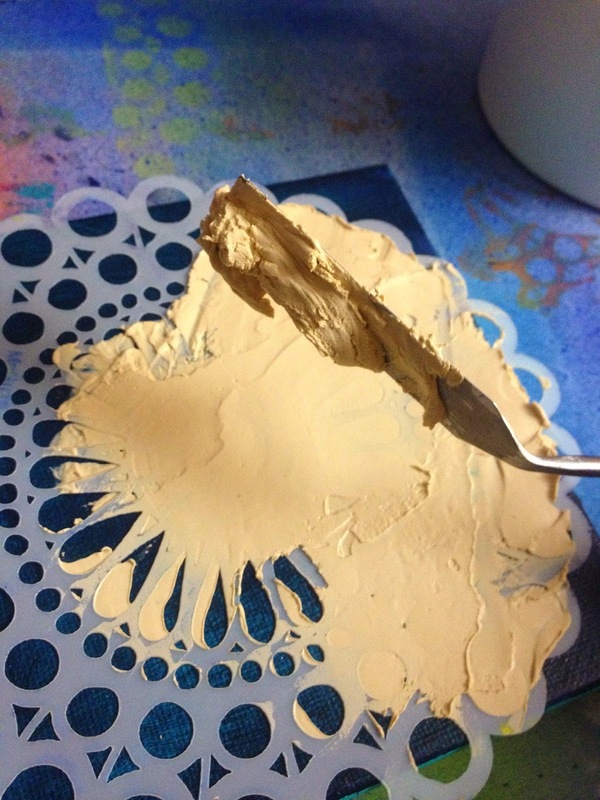 The top of the lid and all four sides of the base were painted with Golden Liquid Thalo Green. 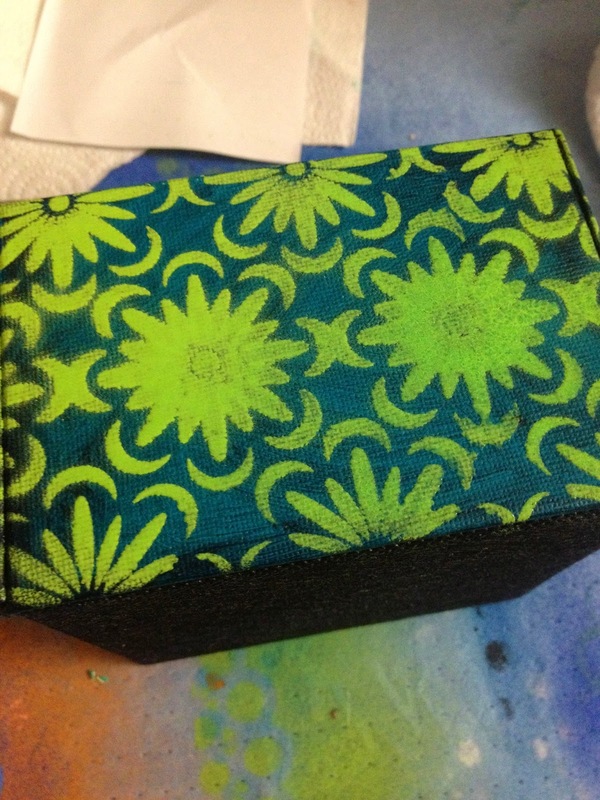 All four sides of the lid were painted with Liquitex Basics aqua. 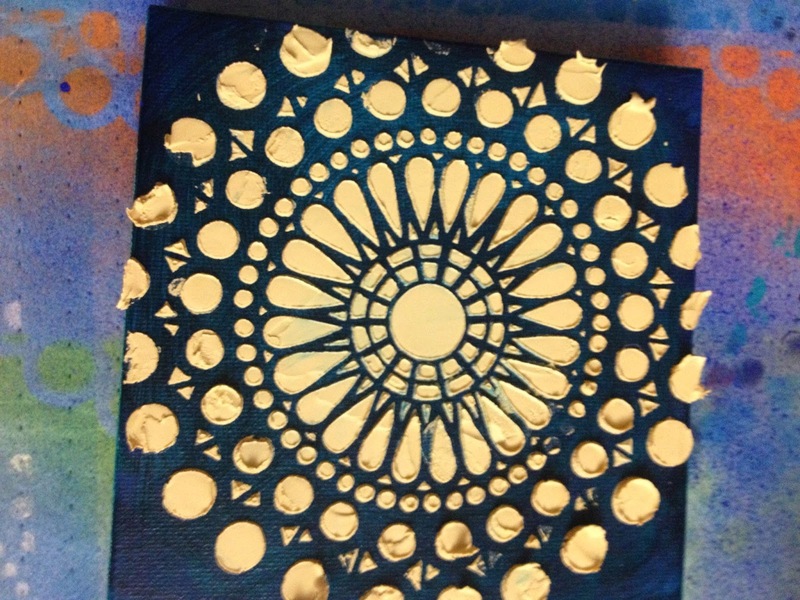 The Stitch A Doily stencil was placed over one side of the box. 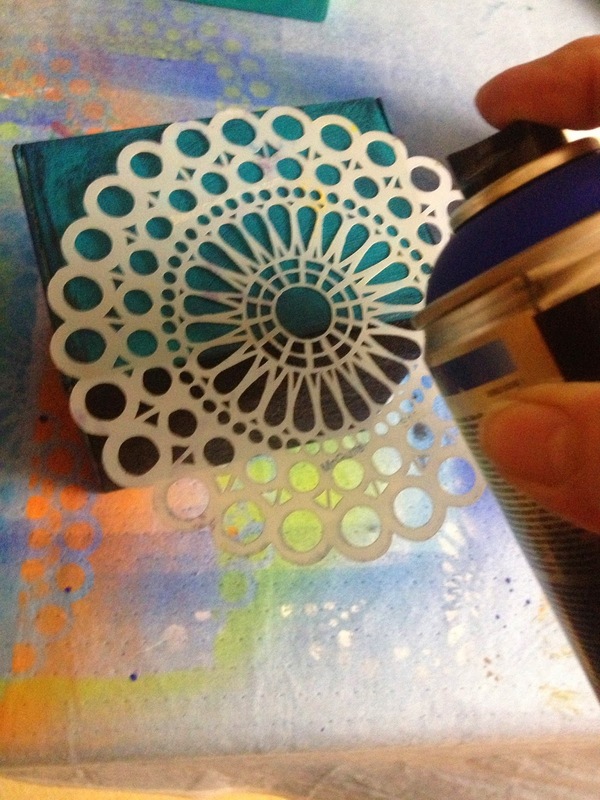 Using Liquitex spray paint in a well-ventilated area, I lightly sprayed over the stencil. I was pretty impressed at how "unstinky" this paint is. I loved the matte finish I got with the deep blue. 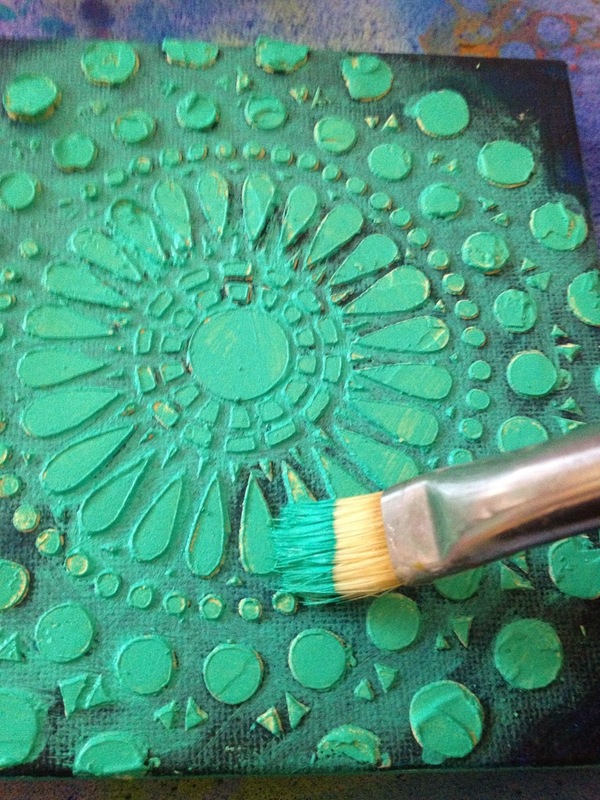 Using the Wood Icing and the same stencil, I spread a thick coat of the product through the stencil with a palette knife. This is what it looks like after the stencil was removed. 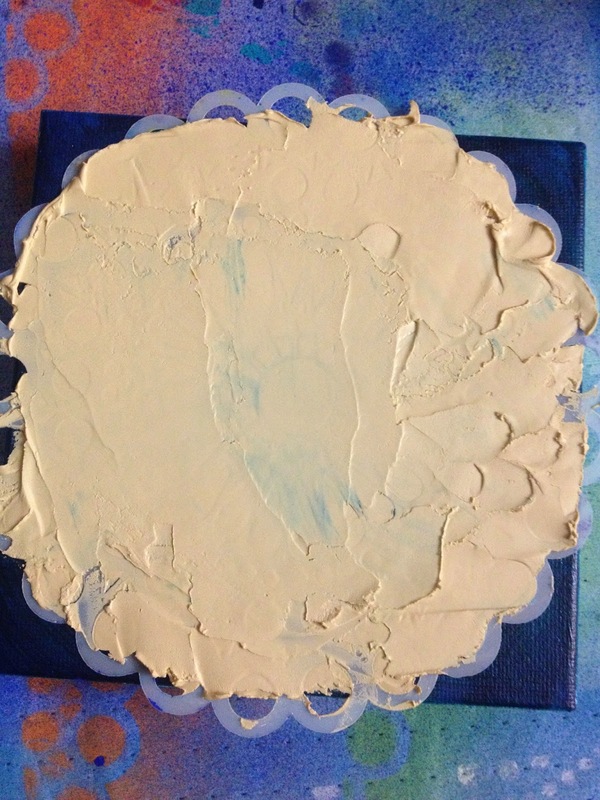 I decided it was an exercise in futility to keep the aqua paint contained on just the raised bits…. So I went back in with a narrow paint brush as well as a couple of tones of marker. I love the rich tones of the greens and blues together. I lightly sprayed them over the Thalo blue color on the box. 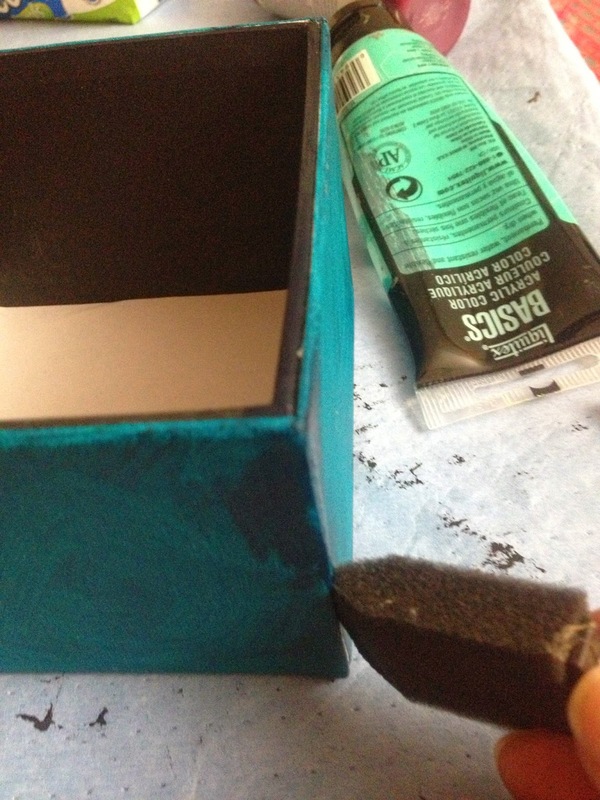 Then, I sprayed each edge of the box lid with the blue paint. I love how these various cool tones of green and blue work well together. 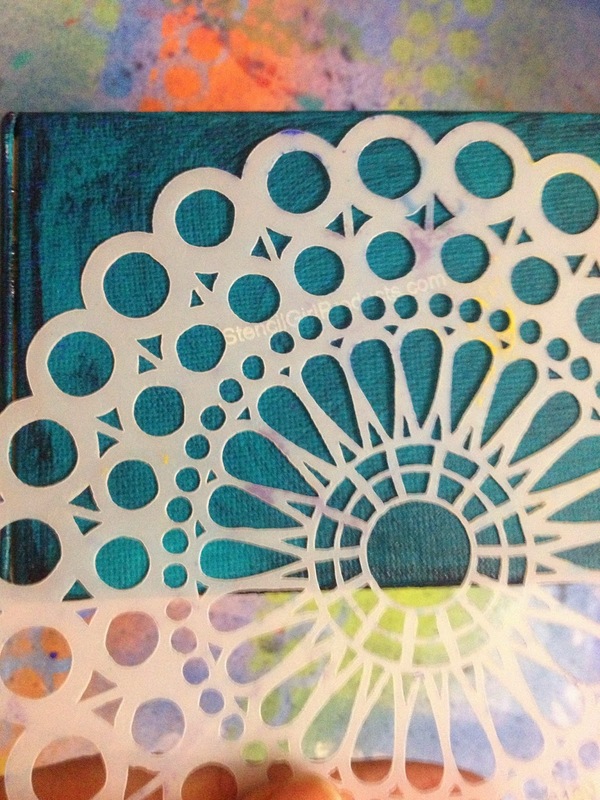 If you want to see another project using the Stitch A Doily stencil please drop by my BLOG today as I have another tutorial there, too! Warm and Cool, who knew? Hi its Desiree here. I love this months theme as it causes me to stop and think about something I do naturally, without much thought anymore. That's the one nice thing about practice, pretty soon it just becomes natural and organic and it can be done without over thinking it. I also need to admit that I am not one to follow rules when it comes to creating art. It needs to be a bit intuitive but knowing some basics about cool and warm can help you create more successful artwork. I thought I would share some simple tips that I use when I am painting that have helped me and I hope they will help you too. COOL TIP: One of the things is that is cool about cool colors is that they go back or make things look like they recede in the painting while warm colors come forward in your painting. That is why when you look at landscapes you will notice that mountains are often painted in blues and purples for a few reasons. First, like I mentioned, those cool colors recede but also the farther things are away from us the more layers of atmosphere cover them. So I always think about layers of blue sky covering things as they get farther away from me. This atmospheric layering also softens the colors so as they go back they also get lighter. 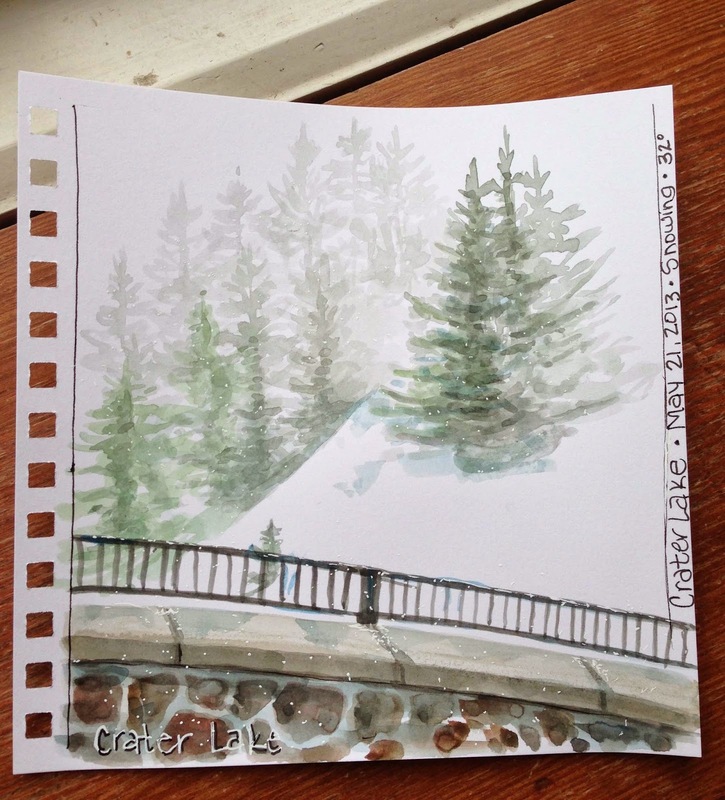 Remember my sketch from Crater Lake, I was tucked in the lodge when the blizzard hit but you can see here how the warm colors of the rock wall stand out from the cool colors of the trees. 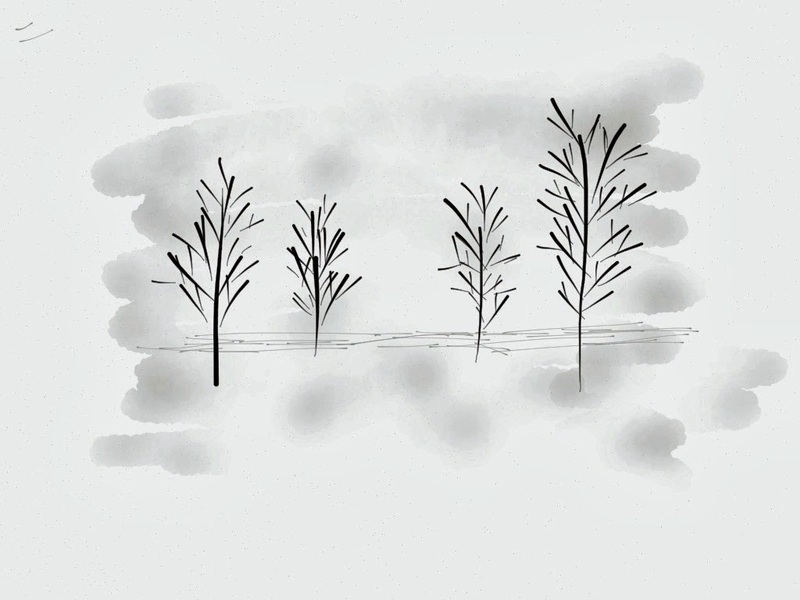 As the trees got farther away they became less colored and lighter (the blizzard also helped the effect). This is also a good tip for creating the look of blowing snow or fog. Do you see how if gives the feeling of depth? 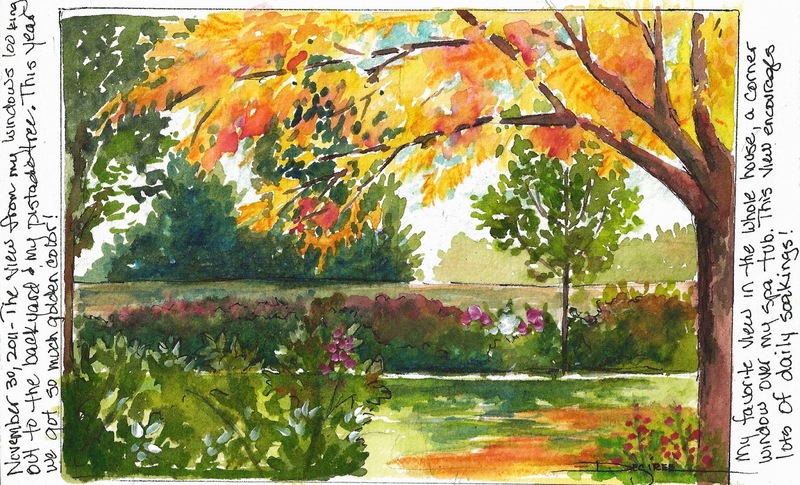 In this sketch from the window at my moms house you can see how the warmer colors come forward and lead your eye through the painting. As the hills get farther away they became cooler and softer. 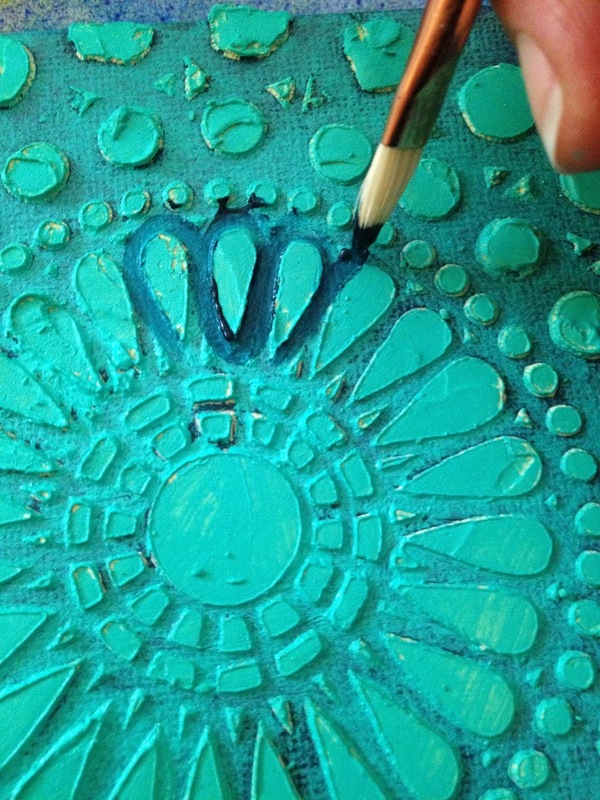 HOT TIP: Warm colors bring things to the front of your painting, they tend to draw your eye. Norman Rockwell would use red in selected areas in his paintings to move your eye around the painting. Next time you see one of his paintings see if you can catch it. It is often something we do with out even realizing it. Do you remember the movie, The Sixth Sense, they used red in much the same way, to bring attention to a specific thing. 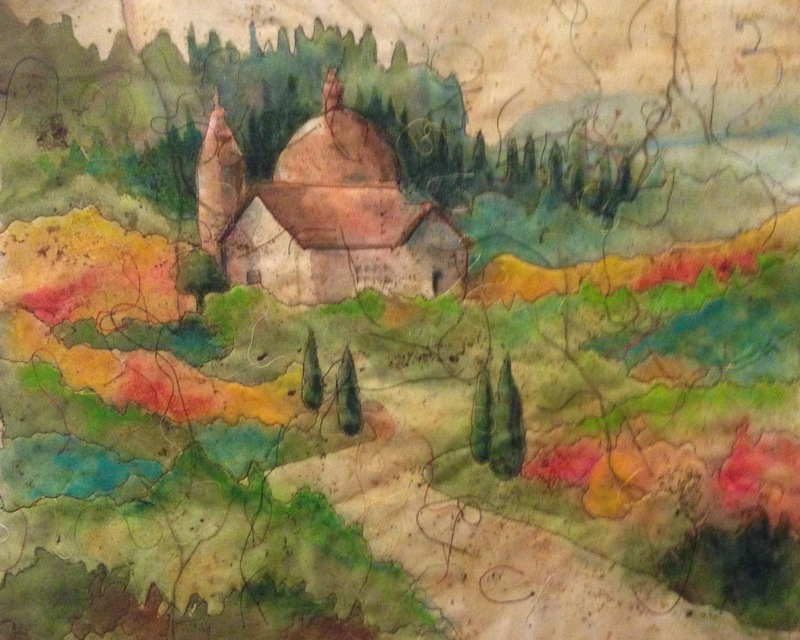 This is a painting that I have done on fabric with acrylic inks. I use cools and warms together to lend interest. Do you notice how your eye follows the red up the path, jumps the road to the bushes on the left and then across the roof to the bushes on the right? I am asking the viewer to explore the painting. See how the stronger colors are close and soften as they recede. I did darken the cypress behind the Duomo to make it stand out even more. But do you see how the warm building comes forward off of the trees behind? I will be teaching this at the San Diego Quilt Show in Sept! Greens can either be cool or warm depending if you use a green blue or a yellow green , do you see that here? Scan back up and see if you notice the warmer greens verses the cooler greens. Cool huh! I love to mix cools and warms, the results are sometimes so exciting! Well, let me encourage you to try and see if you can create the feeling of things receding and moving forward using cool and warm colors this week in your sketchbooks. But most of all have fun!! Hope to see you in San Diego! I hope you will pop over to my blog and sign up for my newsletter. That way you will stay informed about all the exciting news and tips from Desiree's Designs!